You must pay any USCIS fees related to this form. I understand and agree. Let's get started. First, let’s get some information to determine your eligibility to file Form I-131. Where will you file this application? From inside the United States From outside the United States In some cases Form I-131 may be filed outside the United States. However, CitizenPath can only support applicants who file while in the U.S. Granting a travel document for individuals outside the United States is an unusual measure. CitizenPath does not support this type of application and recommends that you contact an experienced immigration attorney to assist you. Are you CURRENTLY in exclusion, deportation, removal, or rescission proceedings? Exclusion, deportation, removal, and rescission proceedings are similar terms to describe a situation that you must appear before an immigration judge and your immigration status is being challenged. As such, the U.S. government is putting you in a legal process to remove you from the United States. If there is a possibility that you have ever been in exclusion, deportation, removal, or rescission proceedings, CitizenPath recommends that you contact an immigration attorney before continuing. Sorry. Based on your answer, you cannot continue. Although you may be eligible to file this application, your situation is complex. Therefore, we recommend that you consult with an experienced immigration attorney instead of using our service. Have you EVER been under immigration proceedings or ordered removed from the United States? Exclusion, deportation, removal, and rescission proceedings are similar terms to describe a situation that a person must appear before an immigration judge and that person’s immigration status is being challenged. As such, the U.S. government is putting you in a legal process to remove you from the United States. A judge ordered you deported or removed. You signed a stipulated removal order. If there is a possibility that you have ever been in immigration proceedings or ordered removed, CitizenPath recommends that you contact an immigration attorney before continuing. Your answer to this question suggests that you have a history which may require the assistance of a legal professional. We want the best result for you, and therefore CitizenPath suggests that you consult with an experienced immigration attorney before continuing. Have you EVER been charged with any misdemeanor or felony crime in the United States? Certain criminal offenses (some misdemeanor crimes and most felony crimes) can affect the success of your application and create significant immigration problems. Even if you have been arrested for a DUI (driving under the influence) or minor crime, you should truthfully answer this question. Even if your application is approved, some criminal offenses can trigger significant problems reentering the United States. Almost any criminal arrest may prompt questioning by the Customs and Border Protection officer at the port of entry. The officer then has the option of placing you in removal proceedings. If the conviction is of a particularly serious nature, it is likely that you would be detained until the date of the hearing. If you have ever been charged with a crime, please contact an experienced immigration attorney before filing any USCIS forms. If your attorney says you may safely proceed on your own, come back and complete your application. Which travel document are you requesting? A Reentry Permit is necessary if you are a permanent resident who plans to travel outside the U.S. for a period of more than one year, but not more than two years. It allows a permanent resident or conditional resident to apply for admission to the United States upon returning abroad during the permit’s validity without the need to obtain a returning resident visa from a U.S. Embassy or consulate. A Refugee Travel Document is similar to a passport. It is issued to a person in valid refugee or asylum status, or to a permanent resident who obtained such status as a refugee or asylee in the United States. Persons who hold asylum or refugee status and are not permanent residents must have a Refugee Travel Document to return to the United States after any period of travel abroad, unless they possess an Advance Parole Document. A Department of Homeland Security (DHS) officer at the U.S. port-of-entry will determine your eligibility when you present your travel document. Parole allows an alien to physically enter into the United States for a specific purpose. An individual who has been “paroled” has not been admitted to the United States and remains an “applicant for admission” even while paroled. The document may be accepted by a transportation company (i.e. airline) in lieu of a visa as an authorization for the holder to travel to the United States. An Advance Parole Document is not issued to serve in place of any required passport. I am in the process of filing or have a pending application to adjust status (Form I-485). I have been granted U nonimmigrant status. I have applied for or have been granted Temporary Protected Status. I am an active beneficiary of the LIFE Family Unity Program in valid status. I have an immigration status other than those listed above. What is the status of your Form I-485, Application to Adjust Status? I have not yet filed Form I-485. I have filed Form I-485, and it's pending. Have you EVER spent time in the United States unlawfully? If you depart the United States after accruing certain periods of unlawful presence in the United States (time spent in the United States illegally) you may be barred from admission for either three years or ten years, depending on the amount of unlawful presence an individual has accrued. Any departure from the United States may trigger this ground of inadmissibility, even if you have obtained an Advance Parole Document. A variety of factors and laws affect the determination of unlawful presence. If you believe that you’ve had any period of unlawful presence, CitizenPath prefers that you speak to an experienced immigration attorney before continuing. I have an approved Form I-821 for TPS. I have a pending Form I-821 for TPS. I will be filing Form I-821 for TPS. Form I-821 is used for Temporary Protected Status. Do not confuse this with DACA (Form I-821D). Although it may be possible to request Advance Parole with a pending TPS application, CitizenPath does not currently support this type of application. We recommend that you contact an experienced immigration attorney to assist you. Did you obtain your current permanent resident status as a result of refugee or asylum status? Sorry. Based on your answer, you cannot continue. You are not eligible to apply for a Refugee Travel Document, but you may be eligible for a Reentry Permit. Are you a permanent resident or conditional permanent resident? A “Permanent Resident” is a standard lawful permanent resident. A permanent resident has a green card that is generally valid for 10 years. A “Conditional Permanent Resident” has a conditional green card that expires after two years. People with conditional permanent residence obtained their status through marriage or a financial investment in a U.S. business. Note: If you are submitting an application to become a permanent resident (Form I-485, Application to Adjust Status), please answer “No” to this question. You are not a permanent resident yet. Did you obtain your current permanent resident status as a direct result of refugee or asylum status? If you initially had refugee or asylee status and now have permanent residence status, select "Yes." If you have never had refugee or asylee status, select "No." For which type of travel document are you applying? Do you currently have refugee status or asylum status? Are you in the process of filing or do you currently have a pending application to adjust status (Form I-485)? Answer "Yes" only if you have filed or will be filing an application to adjust status to a permanent resident. Have you been granted U non-immigrant status (U visa)? Do you have an approved or pending Form I-821, or will you be filing Form I-821 along with this Application for Travel Document? Form I-821 is used for Temporary Protected Status. Do not confuse this with DACA (Form I-821D). Are you currently an active beneficiary of the LIFE Act Family Unity Program in valid status? Family Unity beneficiaries may travel outside the U.S. temporarily for urgent humanitarian reasons or in furtherance of a significant public benefit, which may include a personal or family emergency or bona fide business reasons. Although there are additional immigration statuses that may file Form I-131, CitizenPath does not support them at this time. We prefer that you work with an experienced immigration attorney. Congratulations, you're likely eligible to apply for an Advance Parole Document with Form I-131. Please click on "Next Page" below to continue your application. Congratulations, you're likely eligible to apply for a Reentry Permit with Form I-131. Congratulations, you're likely eligible to apply for a Refugee Travel Document with Form I-131. Now, let’s get some information about your travel. USCIS will not issue a new travel document to someone who already has a valid travel document, unless the document has been returned to USCIS or has been lost, stolen or destroyed. Have you ever been issued a Reentry Permit or Refugee Travel Document? When was the most recent document issued? If the travel document is no longer in your possession and you do not know the issue date, you may check "I don't know the date" above. You entered an invalid date. Please enter a valid date in the past. Has the travel document expired? If the travel document is still valid, select "No." If the travel document is no longer in your possession and you do not know the expiration date, "unknown" is an acceptable answer. Where is the travel document now? I have it and will return it with this application. I never received it. It is lost. It was stolen. It was destroyed. It was mutilated. Other USCIS will not issue a new travel document to someone who already has a valid travel document, unless the document has been returned to USCIS or has been lost, stolen or destroyed. As an Adjustment of Status Applicant, you may request a multi-use (more than one trip) advance parole document. Indicate the first date you anticipate leaving. It's generally recommended that trips be less than 90 days in length. When do you intend to leave the United States? Enter the date you expect to depart for your trip abroad. Provide a reasonable date based on normal processing times. If this will be an urgent request, you may select "I will travel upon approval" above. You entered a date in the past. Please enter the future date you want to travel. How many days do you expect to be outside the United States? Enter the expected length of your trip (in number of days). If uncertain, estimate the days to be the best of your ability. Based on your application type, you are not required to respond the following two questions. We make them available for those that prefer to answer. Need more space? Check the box and we'll explain how to continue your answer on a separate sheet. Directions will be provided in your filing instructions. You are not required to provide a reason for your trip. In fact, USCIS instructs you to skip this question. If you prefer to provide a purpose, you can provide a simple statement. I intend to make multiple temporary visits of less than 90 days to visit family and friends. I intend to travel abroad temporarily (trips of less than 90 days) for business and pleasure. I plan to attend a seminar for professional development. I intend to temporarily provide care for my mother while she recovers from surgery. Type the name of each country you plan to visit. Since becoming a U.S. permanent resident (or during the past 5 years, whichever is less) how much total time have you spent outside the United States? a permanent resident who is a professional athlete and regularly competes in the United States and worldwide. A Reentry Permit issued to a conditional resident is valid for two years from the date of issuance, or to the date the conditional resident must apply for removal of the conditions on his or her status, whichever date comes first. Permanent residents that want to naturalize as U.S. citizens should also understand how extended time outside the country can affect the continuous residence and physical presence requirements for citizenship. Since you became a U.S. permanent resident, have you ever filed a Federal income tax return as a nonresident or failed to file a Federal income tax return because you considered yourself to be a nonresident? Filing a Federal income tax return as a nonresident or failing to file a tax return because you considered yourself to be a nonresident can put your lawful permanent resident status in jeopardy. If you did not file a tax return because you considered yourself to be a “non-U.S. resident,” this is most likely a very serious problem. 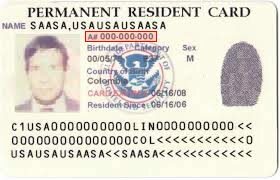 By indicating that you are a non-U.S. resident, you are suggesting that you have abandoned your status as a U.S. permanent resident. Contact an immigration attorney before filing Form I-131. Your answer to this question suggests that you have a history which may require the assistance of a legal professional. We want the best result for you, and therefore CitizenPath suggests that you consult with an experienced immigration attorney. From which country are you a refugee or asylee? Please select... Afghanistan Albania Algeria Andorra Angola Antigua and Barbuda Argentina Armenia Aruba Australia Austria Azerbaijan Bahamas, The Bahrain Bangladesh Barbados Belarus Belgium Belize Benin Bhutan Bolivia Bosnia and Herzegovina Botswana Brazil Brunei Bulgaria Burkina Faso Burma Burundi Cambodia Cameroon Canada Cape Verde Central African Republic Chad Chile China Colombia Comoros Congo, Democratic Republic of the Congo, Republic of the Costa Rica Cote d'Ivoire Croatia Cuba Curacao Cyprus Czech Republic Denmark Djibouti Dominica Dominican Republic East Timor (see Timor-Leste) Ecuador Egypt El Salvador Equatorial Guinea Eritrea Estonia Ethiopia Fiji Finland France Gabon Gambia, The Georgia Germany Ghana Greece Grenada Guatemala Guinea Guinea-Bissau Guyana Haiti Holy See Honduras Hong Kong Hungary Iceland India Indonesia Iran Iraq Ireland Israel Italy Jamaica Japan Jordan Kazakhstan Kenya Kiribati Korea, North Korea, South Kosovo Kuwait Kyrgyzstan Laos Latvia Lebanon Lesotho Liberia Libya Liechtenstein Lithuania Luxembourg Macau Macedonia Madagascar Malawi Malaysia Maldives Mali Malta Marshall Islands Mauritania Mauritius Mexico Micronesia Moldova Monaco Mongolia Montenegro Morocco Mozambique Namibia Nauru Nepal Netherlands Netherlands Antilles New Zealand Nicaragua Niger Nigeria North Korea Norway Oman Pakistan Palau Palestinian Territories Panama Papua New Guinea Paraguay Peru Philippines Poland Portugal Qatar Romania Russia Rwanda Saint Kitts and Nevis Saint Lucia Saint Vincent and the Grenadines Samoa San Marino Sao Tome and Principe Saudi Arabia Senegal Serbia Seychelles Sierra Leone Singapore Sint Maarten Slovakia Slovenia Solomon Islands Somalia South Africa South Korea South Sudan Spain Sri Lanka Sudan Suriname Swaziland Sweden Switzerland Syria Taiwan Tajikistan Tanzania Thailand Timor-Leste Togo Tonga Trinidad and Tobago Tunisia Turkey Turkmenistan Tuvalu Uganda Ukraine United Arab Emirates United Kingdom Uruguay Uzbekistan Vanuatu Venezuela Vietnam Yemen Zambia Zimbabwe Other Select your country of birth from the list. If your country isn't listed, then choose "Other" at the bottom of your list and type your country below. Do you plan to travel to the country named above? There are significant risks associated with travel to your country of claimed persecution. You may lose your status in the United States. CitizenPath cannot help you with this application, and we recommend that you work with an experienced immigration attorney. Returned to the country named above? Applied for and/or obtained a national passport, passport renewal, or entry permit for that country? Applied for and/or received any benefit from such country (for example, health insurance benefits)? Reacquired the nationality of the country named above? Been granted refugee or asylee status in any other country? How many trips do you intend to use this Advance Parole Document? Nice job! You’re more than half way there. Now we need to get some information about the applicant. Provide your current legal name. Spell out middle names completely. If you do not have a middle name, you may leave this field empty. You may list a valid residence, APO, C/O, or commercial address. This may be a Post Office address (P.O. Box) if that is how you receive your mail. If your mail will be sent to someone other than yourself, please include an “In Care of Name” as a part of your mailing address. If your mailing address is a U.S. territory and it contains an urbanization name, list the urbanization name in the "In Care of Name" box. Is there an apartment, suite or floor? Please select... Afghanistan Albania Algeria Andorra Angola Antigua and Barbuda Argentina Armenia Aruba Australia Austria Azerbaijan Bahamas, The Bahrain Bangladesh Barbados Belarus Belgium Belize Benin Bhutan Bolivia Bosnia and Herzegovina Botswana Brazil Brunei Bulgaria Burkina Faso Burma Burundi Cambodia Cameroon Canada Cape Verde Central African Republic Chad Chile China Colombia Comoros Congo, Democratic Republic of the Congo, Republic of the Costa Rica Cote d'Ivoire Croatia Cuba Curacao Cyprus Czech Republic Denmark Djibouti Dominica Dominican Republic East Timor (see Timor-Leste) Ecuador Egypt El Salvador Equatorial Guinea Eritrea Estonia Ethiopia Fiji Finland France Gabon Gambia, The Georgia Germany Ghana Greece Grenada Guatemala Guinea Guinea-Bissau Guyana Haiti Holy See Honduras Hong Kong Hungary Iceland India Indonesia Iran Iraq Ireland Israel Italy Jamaica Japan Jordan Kazakhstan Kenya Kiribati Korea, North Korea, South Kosovo Kuwait Kyrgyzstan Laos Latvia Lebanon Lesotho Liberia Libya Liechtenstein Lithuania Luxembourg Macau Macedonia Madagascar Malawi Malaysia Maldives Mali Malta Marshall Islands Mauritania Mauritius Mexico Micronesia Moldova Monaco Mongolia Montenegro Morocco Mozambique Namibia Nauru Nepal Netherlands Netherlands Antilles New Zealand Nicaragua Niger Nigeria North Korea Norway Oman Pakistan Palau Palestinian Territories Panama Papua New Guinea Paraguay Peru Philippines Poland Portugal Qatar Romania Russia Rwanda Saint Kitts and Nevis Saint Lucia Saint Vincent and the Grenadines Samoa San Marino Sao Tome and Principe Saudi Arabia Senegal Serbia Seychelles Sierra Leone Singapore Sint Maarten Slovakia Slovenia Solomon Islands Somalia South Africa South Korea South Sudan Spain Sri Lanka Sudan Suriname Swaziland Sweden Switzerland Syria Taiwan Tajikistan Tanzania Thailand Timor-Leste Togo Tonga Trinidad and Tobago Tunisia Turkey Turkmenistan Tuvalu Uganda Ukraine United Arab Emirates United Kingdom Uruguay Uzbekistan Vanuatu Venezuela Vietnam Yemen Zambia Zimbabwe Other Select the country where you were born. If you cannot find your country, select "Other." Please select... Afghanistan Albania Algeria Andorra Angola Antigua and Barbuda Argentina Armenia Aruba Australia Austria Azerbaijan Bahamas, The Bahrain Bangladesh Barbados Belarus Belgium Belize Benin Bhutan Bolivia Bosnia and Herzegovina Botswana Brazil Brunei Bulgaria Burkina Faso Burma Burundi Cambodia Cameroon Canada Cape Verde Central African Republic Chad Chile China Colombia Comoros Congo, Democratic Republic of the Congo, Republic of the Costa Rica Cote d'Ivoire Croatia Cuba Curacao Cyprus Czech Republic Denmark Djibouti Dominica Dominican Republic East Timor (see Timor-Leste) Ecuador Egypt El Salvador Equatorial Guinea Eritrea Estonia Ethiopia Fiji Finland France Gabon Gambia, The Georgia Germany Ghana Greece Grenada Guatemala Guinea Guinea-Bissau Guyana Haiti Holy See Honduras Hong Kong Hungary Iceland India Indonesia Iran Iraq Ireland Israel Italy Jamaica Japan Jordan Kazakhstan Kenya Kiribati Korea, North Korea, South Kosovo Kuwait Kyrgyzstan Laos Latvia Lebanon Lesotho Liberia Libya Liechtenstein Lithuania Luxembourg Macau Macedonia Madagascar Malawi Malaysia Maldives Mali Malta Marshall Islands Mauritania Mauritius Mexico Micronesia Moldova Monaco Mongolia Montenegro Morocco Mozambique Namibia Nauru Nepal Netherlands Netherlands Antilles New Zealand Nicaragua Niger Nigeria North Korea Norway Oman Pakistan Palau Palestinian Territories Panama Papua New Guinea Paraguay Peru Philippines Poland Portugal Qatar Romania Russia Rwanda Saint Kitts and Nevis Saint Lucia Saint Vincent and the Grenadines Samoa San Marino Sao Tome and Principe Saudi Arabia Senegal Serbia Seychelles Sierra Leone Singapore Sint Maarten Slovakia Slovenia Solomon Islands Somalia South Africa South Korea South Sudan Spain Sri Lanka Sudan Suriname Swaziland Sweden Switzerland Syria Taiwan Tajikistan Tanzania Thailand Timor-Leste Togo Tonga Trinidad and Tobago Tunisia Turkey Turkmenistan Tuvalu Uganda Ukraine United Arab Emirates United Kingdom Uruguay Uzbekistan Vanuatu Venezuela Vietnam Yemen Zambia Zimbabwe Other Select the name of the country where you are currently a citizen or national. If you are stateless, select the name of the country where you were last a citizen or national. If you are a citizen or national of more than one country, select the name of the foreign country that issued your last passport. Also known as an "A-Number," your Alien Registration Number is an 8- or 9-digit number that can be found on your Permanent Resident Card or Employment Authorization Card. Also known as an A-Number or USCIS#, an Alien Registration Number is an 8 or 9 digit number that can be found on many different USCIS documents. 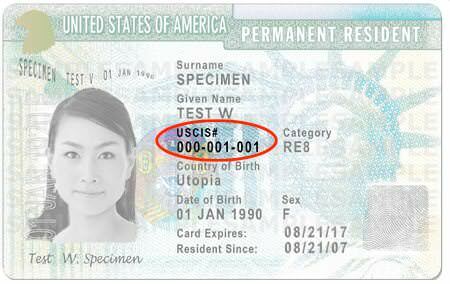 Permanent Residents can find the A-number on a Permanent Resident Card (also known as a green card). 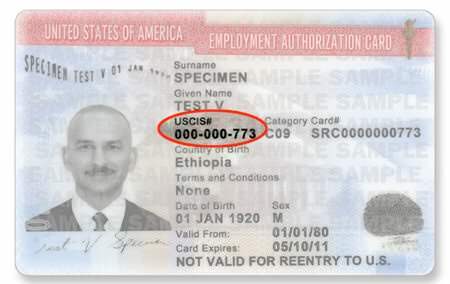 In this example above of a newer green card, the A-Number is listed as “000-001-001” underneath USCIS#. In the example above, the A-Number is listed as “000-000-000” next to A#. The A-Number that can be found on an Employment Authorization Card (work permit) if you have one. In the example above, the A-Number is listed as “000-000-773” next to USCIS#. The A-Number can also be also found on other immigration documents such as an I-797, Notice or Action. Only use a valid A-Number that was issued to you. Enter only a valid number issued by the Social Security Administration. If you were not issued a valid Social Security Number, do not enter one. 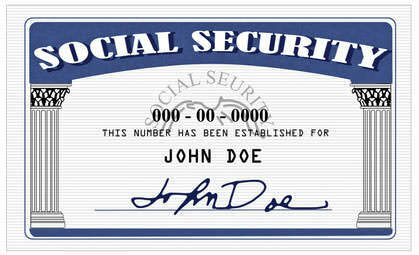 If you have a Social Security number, you can find it on your Social Security card. Some other places that you can find your SSN are on tax returns, pay statements, and bank statements. However if you do not have a Social Security number, leave this field empty. Using a false SSN may result in your application being denied. This contact information is so that USCIS can reach you. Your mobile phone number and/or email address will be used so that CitizenPath can create a complimentary Form G-1145 for you. By submitting G-1145 with Form I-131, USCIS will text and/or email when they have accepted the application for processing. You've reached the last page! Let's get some final details. Shortly after you filed Form I-485, USCIS would have mailed you Form I-797C, Notice of Action, to acknowledge receipt of the adjustment of status application. 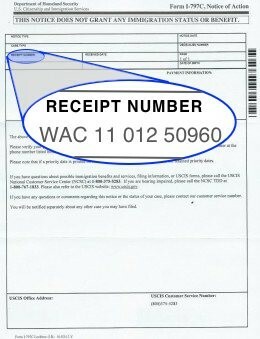 This is commonly known as a receipt notice, and most people receive it about 2-3 weeks after filing. USCIS will grant urgent travel authorization in some cases. By answering yes, CitizenPath will provide you with additional instructions for requesting expedited service. This is not a guarantee that USCIS will grant your request. Do you have an urgent need to obtain this travel document? USCIS will grant urgent travel authorization in some cases. By answering yes, CitizenPath will provide you with additional instructions for requesting expedited service. Please select... I am the applicant, and I prepared this application. I am not an attorney or accredited representative but have prepared this application on behalf of the applicant and with the applicant's consent. I am an attorney or accredited representative of the applicant that prepared this application. Will you also represent the applicant? Immediately after payment, you will be forwarded to a confirmation page to download your files. You will also receive a confirmation email that includes a link to the download page so that you may return later. For an additional $15, we will print a copy of your completed form and filing instructions and mail them directly to you. The documents will arrive in 3-5 business days via U.S. Postal Service. Have a coupon code? Enter it here.. Does your credit card have a US billing address? 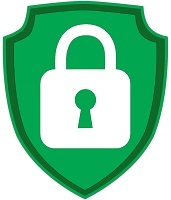 The security code is the last 3 digits on the back of your Visa, MasterCard, or Discover card. The security code on American Express cards is the 4-digit number on the front of your card above your account number. By clicking 'Place Order' you agree to the Terms and Conditions. We guarantee USCIS will approve your form. (Read the details). If USCIS denies your immigration application, CitizenPath will refund our fee and reimburse your USCIS fees. If USCIS issues a final denial of a USCIS application that you created via CitizenPath’s software, we will refund the fee you paid to CitizenPath for use of the service and reimburse any fee you paid to the government in direct connection to the same application. For the complete policy, refer to our guarantees page. If you’re not 100% satisfied using CitizenPath’s immigration services, we’ll refund your money. If you’re not satisfied with our service, give us the opportunity to resolve your problem. Contact us during our normal business hours. If your problem cannot be resolved within forty-eight (48) hours of contacting us, we will provide a refund of your purchase. For the complete policy, refer to our guarantees page.